From 2009 to 2013 I was project manager for Tecumseh Lies Here, a pervasive history education game. Working with Professor Rob MacDougall and a team of researchers and designers at Western, we created an alternate reality game for adults, and then an augmented reality “untextbook” for grades 6 to 8. Both versions of the game focused on the life of Tecumseh, the legendary Shawnee warrior wh o led a confederacy of First Nations against the United States during the War of 1812. Tecumseh was killed at the Battle of the Thames in 1813, not far from London, Ontario, and mystery surrounding his last moments and his final resting place have been a source of macabre fascination ever since. Our game was intended as a kind of “subversive commemoration” which explored how different groups remember Tecumseh and the War of 1812, and how the memory of the Shawnee leader has been used, abused, and appropriated for different reasons over two centuries. Clues were scattered around the London area and collected by the players. The first iteration ran for six weeks in 2011. As an “alternate reality game”, it intentionally blurred the lines between the gaming space and the real world. Alternate reality games spread out across the internet, on Twitter, in blogs, e-mails, and wikis, before spilling onto streets and into libraries and museums. 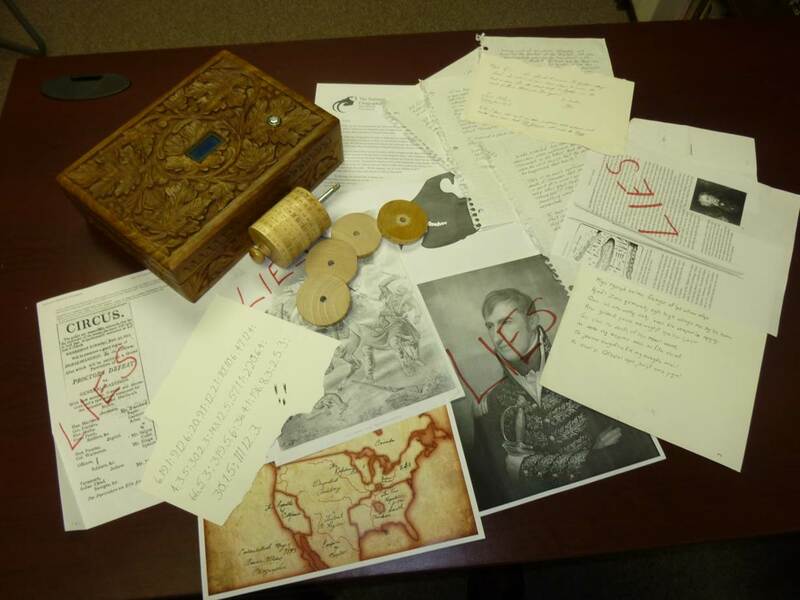 About two dozen students and others in and around the University of Western Ontario’s public history program participated, with a core of around 12 who found themselves caught up in an fictional mystery and race against time where they had to do the work of real historians in order to save the day and win the game. We partnered with local museums and historic sites to make this a truly community-based learning experience. Though this was a very labour intensive project, it did show that this genre of game play is ideal for teaching everything from primary research skills to evaluating competing interpretations of the past. Read Adriana Ayer’s reflection on playing Tecumseh Lies Here at Active History. In 2013 we produced a second version of Tecumseh Lies Here for middle school students in South-western Ontario. About 100 students used our augmented reality “untextbook” powered by Layar, we presented students with the same historical thinking skills we use at the university level. Our students used smart phones and tablets to see competing interpretations and multiple perspectives of historical events right on the page. The AR permits students to peel back the layers to see beyond a single authoritative voice and learn how history is constructed from fragmentary and conflicting evidence. For a discussion of the game development in progress, see Timothy Compeau and Robert MacDougall, “Tecumseh Lies Here: Goals and Challenges for a Pervasive History Game in Progress” in Kevin Kee. ed. Pastplay: Teaching and Learning History with Technology (Ann Arbor: University of Michigan Press, 2014), 87-108.